New Zealand may be a small contributor to global greenhouse gas emissions, but on a per capita basis our emissions are very high, so we have a responsibility to be part of the solution rather than part of the problem. Climate science and climate politics are frequently reported in the media, so some form of assessment of New Zealand’s role and options is worthwhile. At the end of the recent G20 meeting in Brisbane the leaders issued a statement stressing the importance of climate change and the urgency of finding suitable responses. They recognised that the situation is different in different countries, but stressed that action to reduce emissions will have to come from all quarters and that an easy first move is the elimination of subsidies for fossil fuels. As was commented at the time, that statement was a rebuff for the government in Australia which had not wanted the issue to be discussed at all, and wants no constraints on its mining industry. It was further commented that Mr. Key, speaking on behalf of New Zealand, has described us as “fast followers” on the issue of emissions reductions. He wants to see the big players (U.S., China, and Europe) play their cards before he will commit to a course of action. Mr. Key has used that phrase “fast followers” before and it’s worth stopping to consider it. Are we really fast? Are we really following? Could we lead? Is Mr. Key using the phrase to deceive the public into believing that there is action when the reality is quite different? Since the end of the Kyoto era, there has been some jostling between countries to set targets for planned reductions of greenhouse gases, most notably carbon dioxide from the burning of fossil fuels. It’s a form of accounting based on promises and hopes rather than on actual data, but it has become the “trading floor” for discussing what level of commitment is appropriate from which countries. Some of the big players have recently updated their targets. Commonly these are based on a percentage of what emissions were at some time in the past, so comparisons are not straightforward. For example, in October the European Commission announced a binding target of a 40% reduction from 1990 levels by the year 2030. Since then the US has announced a plan for cutting emissions by 28% compared to 2005 levels by 2025. That’s a smaller percentage of a higher figure, but in a shorter timeframe. World leaders Denmark have a legally binding commitment of a 40% cut (compared to 1990 levels) by 2020 and a plan for zero emissions by 2050. And what of us here in New Zealand? Our target is set at a cut of just 5% from 1990 levels by 2020. 5% looks like a very modest target in comparison with the commitments elsewhere, so are we really “fast following” or are we being left behind? Targets are necessary for planning, but they do not always equate to actual emissions of actual greenhouse gases. Those setting targets based on 1990 levels have to bear in mind that present day emissions are, in many cases, much higher than they were then, so the turnaround required is greater than it first looks. So how does NZ compare on what really goes into the atmosphere? More particularly, what has been the change in annual emissions in recent years? Europe leads the way with a 9.3% reduction in emissions between 1990 and 2007. They are heading in the right direction. Contrast that with a 16.8% increase in the same time period in the United States and we see how big is the challenge they are facing. China is the extreme case with their recent economic development showing a massive 120% increase in emissions (1990-2007), although from what we would see as a low base. In New Zealand we are also going backwards. Our per capita emissions increased by 22.1% from 1990 to 2007. If we are to reach that modest target of a 5% cut by 2020 we need to reduce our output of carbon dioxide and methane by at least a quarter from current levels. That will require significant changes to the way we live, work and play. If we intend to be fast followers we should at least be pointing in the right direction. So where are we? Our leaders, like those from around the world (except Australia) acknowledge the importance of the issue, and the need for action. They have listened to the UN Secretary General as he called for significant and sustained cuts to emissions of the gases that are causing climate change. But unlike other countries we have made very modest commitments to contribute to the solution and unlike some other countries, our emissions are in fact trending steeply up when they need to come sharply down. It would seem reasonable to assume that the Government has a plan to get us out of this mess so that we can set more challenging targets and have a chance of meeting them. But the Government has never had a plan, instead suggesting that the Emissions Trading Scheme would provide the solution. The ETS has been in place for a number of years now and it has done nothing to curb the rise in emissions still less to set them on a downward trajectory. That’s because it hasn’t put a meaningful price on carbon, hasn’t set a cap on the amount of carbon dioxide produced and has exempted some of the most polluting industries in the country. Observers pointed out when the ETS was set up, and when it was amended, that it could not possibly achieve what was needed and they have been proved right. So “Plan A” is failing and there is no “Plan B”. It should not be too difficult for New Zealand to look around the world to see what works and to look at our own emissions profile to identify where we could most easily and effectively make plans to reduce our emissions of carbon dioxide and the other greenhouse gases. They are science-led. This is an area rich with technical knowledge and understanding. The laws of physics are not up for debate so the science must carry weight over the short-term politics. They are well supported. The public need to have an understanding of the science and the solutions, so that inevitable changes are supported. Plans with cross-party support in parliament are much more likely to survive the trauma of future elections. They are compassionate. In any widespread societal change there will be winners and losers. Successful change identifies the potential losers and offers some form of compensation without derailing the whole process. When we as a nation have a suitably ambitious goal (my personal suggestion is to follow the European lead and target a 40% reduction compared to 1990 levels by 2030), we will need some strategies to get us there. Some of these might appear to be quite painful, so we should follow the advice of the G20 and do the easy things first. Subsidies. In New Zealand we tend to imagine that subsidies are a thing of the past and when we think of subsidies for fossil fuels we probably have in mind an image of jerry-cans of diesel in Africa. But 21st Century subsidies are more sophisticated than that. In NZ we subsidise the fossil fuel industry by granting minerals and exploration permits at discount prices. We send Government Ministers to support the applications of overseas mining companies who plan to dig for coal, and we supply geophysical data from Crown Research Institutions to multinational corporations. At the same time our Government hypocritically supported the establishment of a UN “Friends of Fossil Fuel Subsidy Reform”. Change here would both save money for the Government and would signal that NZ is taking its responsibilities seriously. Mining. We still have a small coal mining industry in NZ, though it employs less than 2,000 people directly and indirectly. A clear and explicit statement of “No new coal mines” would not cost any jobs and would send a message to industry that the end of coal in NZ is in sight. Contraction, rather than expansion, of the fossil fuel industries has to be our goal. Exploration. Currently the world has known fossil fuel reserves amounting to about five times the quantity that can safely be burned if we are to stay within the carbon budget set by 2 degrees of warming. So the majority of the coal, oil and gas that is already known about will have to stay unburned in the ground. The Government could announce immediately an end to exploration for fossil fuels on land or in the ocean. Public Services. The government is a big player in the energy market via public services such as schools and hospitals. A policy of new boilers for public buildings using wood waste / biomass would cut our domestic use of fossil fuels and at the same time provide a boost for the biomass energy industry. The redeveloped Christchurch Hospital is an example where future emissions could be saved by wise decision making now. Transport. The last four years have seen a wide range of ideas circulated in Christchurch, my home city, for ways to ease transport congestion / cut costs / make the city more pleasant / reduce emissions. So walking, cycling and public transport are all ready to replace the car. Again, the necessary changes could be brought in relatively quickly and painlessly. In fact everybody would benefit immediately. Electricity. We generate an unusually large percentage of our electricity from renewables in this country, but we could do so much better. There are wind and solar installations ready and consented and waiting to be built but king coal is blocking the way. Announcing a date for the end of electricity generation by coal, oil or gas signals the start of the age of renewables. The Government might be forgiven for thinking that all of those changes would be difficult or controversial to push through. If so, there is the “small government” solution to the problem – let the market regulate itself. The way to do that is to impose a tax on fossil fuels, either when they are extracted or at the point of importation. As long as the tax is unavoidable and known to be increasing over time the signal to industry is clear; fossil fuels are a thing of the past. Then stand back and let the creative genius of New Zealand get to work on devising systems and solutions that will usher in the zero carbon economy. Since there will be genuine concerns that those in energy poverty will end up paying a disproportionately high share of the tax it is both possible and fair to make it redistributive. That way there is no net gain for the Treasury, but wealth moves from the polluters to those in need. It’s the polluter pays principle in action. All of these ideas – and many more – are in use around the world in countries where the responsibility to cut greenhouse gas emissions is taken seriously. They have been shown to work, and the countries concerned haven’t suffered huge economic setbacks. In fact, it’s changes like these that set a country on the path to a more sustainable future. It’s far too late for New Zealand to be a leader on these issues – the leaders are already way ahead. But we do have a chance to turn around the way New Zealand functions so that our emissions are reducing towards an agreed and ambitious goal. It will require changes to the way we live and work, it will require targeted investment and it will require an honest appraisal of our best opportunities to make the most difference. Real change will not happen if we carry on hiding behind a “business as usual” approach or some tired rhetoric that pretends we are fast followers. Currently we are not fast followers. But we could be. And we should be. 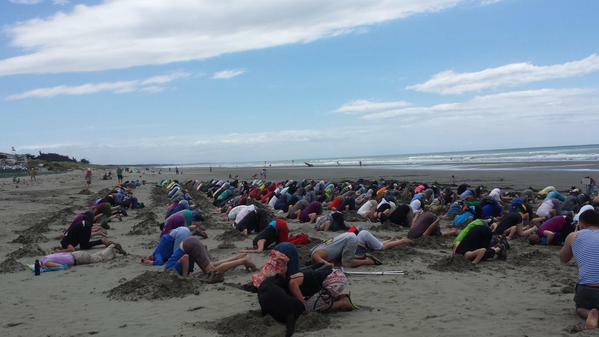 PreviousWe put our Heads in the Sand last Sunday. This Monday, it’s time to tell National MPs to Cut the Gap on climate change.